Caine: the most infamous man in the Ankhanan Empire. A hero who has saved the Empire from invasion and destruction, and a villain who killed the Prince-Regent on the orders of a monastic order. Wherever there is danger, intrigue or violence, there is Caine. In reality, Caine is a fictional character, played by Hari Michaelson. 23rd Century Earth is linked to Overworld - a post-medieval alternate reality where magic and gods are real - by advanced technology. The rigidly caste-bound population of the overcrowded planet is entertained by the exploits of the Actors, and Caine is one of the most famous Actors on the planet. When Caine's wife, Actor Shanna (who plays Caine's lover, Pallas Rill), disappears on an Adventure, Caine is summoned back into battle. This time the mission is to find his wife before her link to Earth expires, killing her, and to overthrow the monstrous new Emperor. But Michaelson faces hidden enemies on Earth even as Caine faces overwhelming odds on Overworld. Matt Stover has carved out a reputation as the best writer ever to put pen to paper in the Star Wars franchise, writing a string of intelligent, thought-provoking books that overcome and challenge the limitations of the setting. 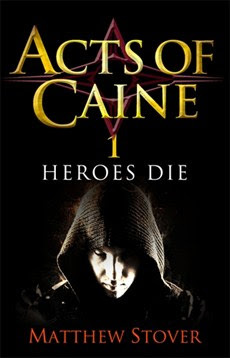 The Acts of Caine is his most famous own creation, a four-book sequence (more are planned) that mixes SF and fantasy. It is an action-packed series, but also one that is heavily character-driven, and those characters (heroes, villains and the ambiguous alike) are three-dimensional, well-motivated individuals, even the most loathsome of whom is at some level understandable. 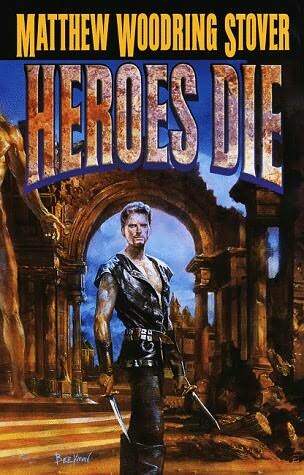 Heroes Die is the first book in the sequence, originally published in 1997, but is a stand-alone novel with no cliffhangers or incomplete story arcs. Its publication date precedes the bulk of the modern 'gritty' wave of fantasy novels, but it can be seen as an early example of the subgenre. The book has a black sense of humour that will appeal to fans of Joe Abercrombie, a rich urban atmosphere and cast of thieves that serves as a precursor to Scott Lynch (Lynch has said that Stover's books are one of the primary influences and inspirations behind The Lies of Locke Lamora) and features a dystopian future world that emphasises death and murder as a form of entertainment in a similar manner (but a much more sophisticated one) to The Hunger Games. It's a rich, genre-bending brew that satisfies on all fronts. The characters are where the book shines. Scenes on Overworld are told from Caine's POV in first-person, but scenes on Earth are related in third-person. Other scenes on Overworld involving other characters are also told in the third-person.This device is quite successful, and is intriguing as Caine's POV scenes also feature his running commentary on what's happening back to the millions of people watching on Earth. Some tension is caused by Caine occasionally thinking things impolitic about life on Earth, causing friction with both the Studio and the future Earth's caste-bound government. Michaelson/Caine is a fascinating character, a man of intelligence who is ready to resort to violence at a moment's notice, but has a reason for doing so. His lover, Senna/Rill is likewise well-depicted, with her idealism contrasted against her lover's pragmatism. Stover even has well-developed villains, making even the monstrous Emperor and the psychopathic swordsman Berne (very briefly) sympathetic with reasons (if only convincing to them) for doing the monstrous things they do. Heroes Die is unusual for the opening volume of a fantasy series by arriving complete, fully-formed and brimming with confidence and presence. It's an explosive and action-packed novel which explores its premise and characters intelligently, develops the plot and themes with skill and then finishes on a high. Complaints are few: one character gains access to a reservoir of incredible power near the end of the book, which has the whiff of deus ex machina until Stover subverts it. Heroes Die (*****) is available now in the USA, and in the UK has just been released for the first time as an e-book only edition. "In reality, Caine is a fictional character, played by Henri Michaelson." Excellent review about one of my all-time favorite authors. 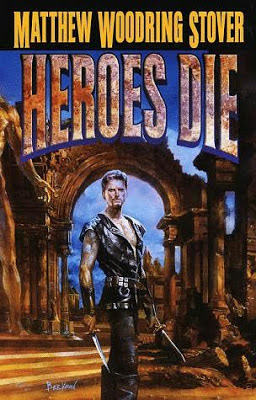 Heroes Die was a game changer in fantasy fiction when it first came out-albeit one that doesn't get near the credit it deserves. I hope your review helps with that. Stefan Rudnicki narrated the Audie Nominated audiobook. We featured this book in a blog, and there is footage of the narrator and the director discussing Stover's amazing writing. I read this just recently and could not put it down. One of the most creative and well-crafted novels I've read in a long time. Excellent in all areas. I will buy anything he writes, and have. I recommend the Planeswalker novel " Test of Metal" as a fine example of Mr Stovers ability to transcend source material in mind blowing fashion. I wouldn't say that Ma'elKoth is monstrous precisely. More like Beyond Good and Evil. Very ubermensch. Also Hari's wife's name is "Shanna"